Luxury is the privilege of those who know how to stage their life. Thierry Mugler is a visionary artist. Beyond beauty and far from simple models, he reinvents the image of each woman. The aesthetic of Thierry Mugler is the art of exercising ones beauty like a game, choosing ones arms, betting on ones assets and winning hearts while playing. - Perfume-artifices that sublimate presence. Thierry Mugler unites simplicity of use and perfection of effect. He invites you into the cult of metamorphosis. 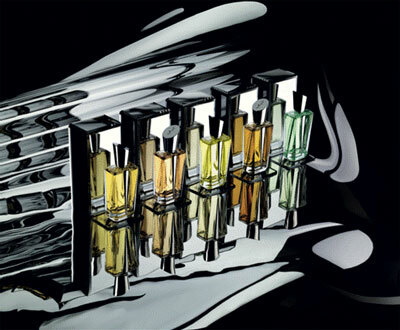 - A collection of fragrances: Miroir, Miroir! A collection of fragrances: MIROIR, MIROIR! For Thierry Mugler, life is full of dreams to be realised and realities to dream up. His fragrances shake up our habits and fantasies. His imagination conjures up so many ideas and opportunities. One such flight of fancy has led to the inspired Miroir, Miroir! collection, a collection of fragrances to arouse desire within ourselves. Our own desires. Because men and women want to meet and be stirred in different ways, like standing before a kaleidoscope of mirrors. With Miroir, Miroir! you have the possibility to transform yourself to more effectively fulfil yourself. With Miroir, Miroir! you have the freedom to play the role of your choice and live your own ideal. These unusual fragrance compositions with their powerful olfactive impact have been created by leading 'noses' in the perfume industry, who are always highly inspired by the dreamlike universe of Thierry Mugler. Giving free reign to their imaginations, each has played in their own way on the metamorphosis theme by including unusual ingredients or creating daring, unexpected accords. They were given total freedom to ensure that these fragrances - like our imaginary mirrors - would arouse unique and contrasting emotions. Emotions which measure up to your personality. The Miroir, Miroir! story begins today with 5 fragrances, and will continue to be enriched to embody other fragrant emotions. Like a modern-day male or female dandy, this is a fragrance that accentuates feminine strengths and masculine fragility. In it, a paradox is created as the most provocative and feminine of flowers, the tuberose, settles at the heart of a very masculine, woody accord which includes the aromatic accents of absinthe. This is a completely unexpected place to find the tuberose. And this fragrance goes even further in pushing ambiguity to extraordinary limits, by introducing the minty freshness of wintergreen which transforms the tuberose into an almost metallic flower of mirrors. "Thierry Mugler told me there is always a new path to explore. Creatures outside of their dreams are ambivalent, so feminine that they can become - men! This fragrance is like the essence of these divinities whose bewitching femininity and powerful virility are united in an eternity of mirrors". An aromatic floral fragrance created by Alexis Dadier, Perfumer, MANE. A fragrance with the aura and allure of youth: simple, airy, yet supremely sophisticated. And like a shimmering cloud, its natural aldehyde (used for the very first time in perfumery) gives a radiance and vibrancy to the bittersweet accord of patchouli and musk. "Thierry Mugler is a visionary who always takes me further into the unknown. By drawing on the aesthetic shocks and paradoxical feelings he evokes in me, I created a fragrance that is both sculptural and airy. The various olfactive building blocks are transcended by a light never seen before, as distinctive as the Mugler woman". A bitter-sweet aldehydic fragrance created by Domitille Bertier, Perfumer, IFF. Eau de Parfum. 50 ml spray - 1.7Fl. Oz. An olfactive trinity: lily for the girl within us, orange blossom for the young bride and milky notes for the mother. The many facets of womanhood come to life in this tantalizing olfactive trinity: lily for the girl within us, orange blossom for the young bride and milky notes for the mother. "The avant-gardism of the Mugler universe is an inexhaustible source of inspiration. I enjoyed imagining a new Muglerian woman who is unlike any other and stands out through her originality. A woman loved for her daring, her capacity to always tend toward the exceptional and who naturally becomes beloved by everyone". A nourishing floral fragrance created by Fabrice Pellegrin, Perfumer, MANE. An unpredictable personality, a contrast of light and dark. The bright side flickers with the effervescence of citrus accords, while the shadowy side races to the forbidden beat of the wildly exciting bitterness of cinchona bark and vetiver, heightened by the black intensity of liquorice. "Thierry Muglers world is peopled with new heroes as fascinating as they are mysterious. Their souls, all chiaroscuro contrasts, make them paradoxical, extravagant beings, at once powerful and fragile. This constant wavering between the pure and obscure led to the creation of this fragrance with an effervescence that is as dark as it is luminous." If the primary aspiration is your own temptation then imagine a fragrance so heavily dosed in exquisite molecules that it could become obsessively addictive. In this one, the unusual notes of toast and sun-warmed skin contrast with and modernise the generous jasmine middle note. Drench yourself in these carnal, gourmand notes and discover how divinely delicious and adorable you can be. "This fragrance is a scented version of the Thierry Mugler silhouettes: outrageous and sassy. It plays on proportions, an overdose of normally minor accords, and a mix of genres, between the naturally feminine and the high-tech synthetics. The result is a totally off-beat and sensual journey. A resolutely futuristic gourmandise." An addictive floral fragrance created by Christine Nagel and Louise Turner, Perfumers, Givaudan.